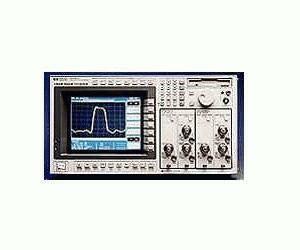 The Agilent 54750A is a modular system. Up to four high-bandwidth channels and TDR are supported by the mainframe. The modular design allows for expansion to meet changing needs. The 20-GHz or 50-GHz bandwidth and the low-noise specifications allow very precise measurements on low-level, high-speed signals. Timebase stability, accuracy, and resolution allow characterization of jitter in the most demanding applications.